My major new wargames project is to build armies and terrain for the Ten Years War in Cuba. The war raged between 1868 and 1878 and is much less well-known than the later Spanish American War which finally resulted in Cuba's independence from Spain. Cuba had been the jewel of the Spanish Empire in Latin America; she was one of Spain's wealthiest colonies and the capital city of Havana was the principal port in the Caribbean. But by 1830 Spain had lost of all her possessions on the American mainland, both North and South retaining just two islands in the Caribbean, those of Puerto Rico and Cuba. Cuba in particular was much valued for her contributions to the coffers of the Spanish monarchy and was usually referred to as the Ever Faithful Isle. This was not a particularly accurate name since, under Spanish rule, there had been revolts and unrest for most of the country's history. 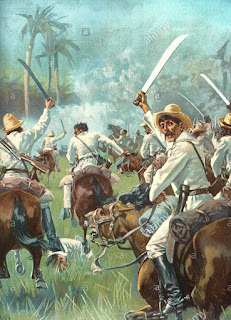 Unrest culminated in the Ten Years War which was followed by an interlude of seventeen years before the cause of independence reared its head again leading to American intervention and the eventual ousting of Cuba's colonial masters. Many commentators and historians see Cuba's history in the late nineteenth century as a continuum, a thirty years struggle for independence; others see a quite distinct series of events. Thus we have the Ten Years War from 1868 to 1878, the Little War of 1879, and the Spanish American War of 1895 to 1898. Whilst the Spanish American War is quite well known the earlier struggles tend to languor in obscurity; tourists walk past statues of unknown figures and along streets named after obscure heroes. Even in Cuba's museums and galleries events of the earliest struggle for independence are overshadowed by exhibits of Castro's Revolution and the exploits of Che Guevara. The Ten Years War was a savage and extended conflict causing immense disruption to the country and severe damage to fifty percent of the island. Homes, public buildings, farms and plantations were all devastated and repeatedly raided by both insurgent soldiers and the Spanish forces which comprised the regular army and the Volunteers - an irregular force of Cubans who acted as savage guardians of the towns and cities. The death toll has been put at 50,000 Cubans and close to 100,000 Spaniards many of whom died not in combat but as a result of the ravages of tropical diseases and hunger. The Ten Years War is of interest to the military historian for a number of reasons. Firstly, it is the first real example of a guerrilla war where circumstances dictated a conscious decision to engage in this type of warfare. The conditions dictating this course of action were the almost overwhelming superiority of the Spanish forces, the brutality with which Spain attempted to crush the rebels, and the immense difficulties faced by the rebels when they tried to obtain weapons and munitions. Secondly, the insurgents attempted to destroy the Cuban economy, thus making Spain's attempts to finance the war untenable. This is therefore an early example of economic warfare or of total war. Thirdly, politics and international relations played a crucial part in the events as did the call for social reform with the eventual aim of abolishing slavery and establishing democratic rule. Further posts will feature making the terrain, roads, buildings and coastline; making figures for the Spanish and Cuban armies; building transport and ships for gun running; developing rules for skirmish actions in the black powder era; and finally, playing the game!